Most people think that watermelons contain only sugar and water…It’s true…well…sort of… Watermelons are made mostly of water, 92% water, actually. But, that last 8% contains some super awesome and important nutrients that your body craves! Watermelons are part of the Cucurbitaceae family, which also includes cantaloupe and honeydew, as well as squash and pumpkins. While they taste extremely sweet, watermelons are relatively low in calories, contain no fat, and contain fiber, which assists digestive processes. 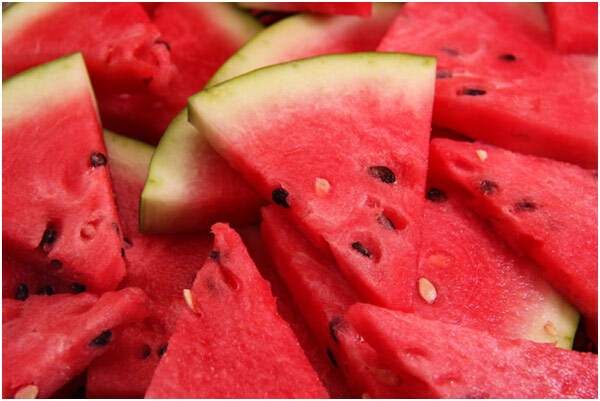 Watermelon has more lycopene, which is thought to decrease the risk of prostate cancer and heart disease, than any other fruit or vegetable, and is also a good source of vitamins A and C, which are both good for your skin. Watermelon contains choline, a nutrient that plays an important roll in a lot of bodily processes including sleep, memory, nerve impulses, and muscle movement. The “water” in watermelon is full of electrolytes and makes for a great refreshing post workout snack! Not only is it delicious and hydrating, but it also contains the amino acid, L-citrulline, which is thought to reduce muscle soreness. Previous PostOne Banana, Two Banana, Three Banana, Four!Next PostAre You Ready, Tampa? The green tea weighting loss nutritional supplements are deed an raising amount of favourite day-to-day in assisting citizenry command their improved excessiveness weight. Numerous pros of the subject agree with the being which the green tea weight loss nutritional supplements unquestionably help in managing the appetence and in this manner help in decreasing the body process of foods and this in turn will cause the reducing of weightiness.